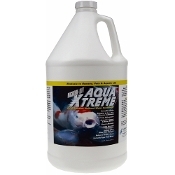 Microbe-Lift AQUA XTREME is a convenient liquid, single-phase, full-function water conditioner that has been scientifically formulated for use in koi and goldfish ponds. Microbe-Lift AQUA XTREME should be used when: conditioning new water for ponds; adding (or prior to adding) water, new fish or plants to ponds; and transporting koi and goldfish. It is very important to use Microbe-Lift AQUA XTREME when adding water to a pond that contains chloramines. Conventional dechlorinators will detoxify the chlorine in the chloramines but do nothing to the ammonia released from the chloramines. Microbe-Lift AQUA XTREME will detoxify both the chlorine and the ammonia in chloramines.